Thanks for all your hard work. I think that everything looks great. He sure is big. I had the chance to listen to a number of visitors on Saturday afternoon and there is no question, he is a show stopper. Our four page color brochure and floor plan give specific information about our show and the requirements of our set up. Click Here to Download Brochure & Exhibit Floor Plan. Click here to watch our CRUNCH video on You Tube ! Please access our reference list. No doubt CRUNCH is a proven attraction. Click here to download our reference list. Click here to download the CRUNCH Fact & Information sheet. 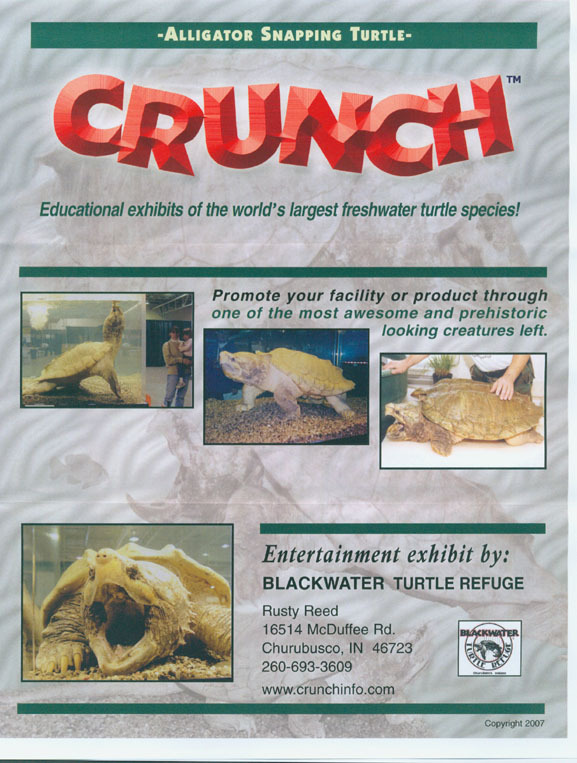 We work to assure you get a first class, entertaining, educational exhibit that draws a crowd. I just wanted to thank you for your top quality Crunch exhibit and your tireless efforts to engage the public in a meaningful way. We had excellent attendance for all three days and no doubt Crunch played a significant role in bringing in those guests. Your ability to be here on Friday morning for TV/press coverage was also very important in bringing in the crowds. Hope you have a safe trip back home. We hope to bring you back again in the future.